(Alabama, 2017) ix + 228 pp. Reviewed by Cynthia J. Davis on 2017-07-03. When Charlotte Perkins Gilman died in 1935, all of the many books of this once-influential author and reformer were out of print. Hailed as the "brains" of the women's movement at the turn into the twentieth century, she began to fall out of favor in the 1910s, when her views had come increasingly to seem not only outdated but also predictable. After her death she remained in eclipse until 1973, when The Feminist Press issued an edition of her most famous short story, "The Yellow Wall-Paper." The publication of that slim volume helped launch something of a cottage industry in literary and cultural studies of Gilman. A recent search for her in the MLA International Bibliography yielded 563 hits, including books, edited collections, dissertations, critical and pedagogical essays, and profiles in a number of different languages published over the span of the past forty-two years. But the initially celebratory tone of the recovery efforts has given way to discomfort with the revelation of Gilman's more reactionary and objectionable views, especially her xenophobic and eugenicist tendencies and her stubborn class biases. After four decades in the critical spotlight, Gilman may appear somewhat faded as a subject, a little worn around the edges. In addition to chafing at her reactionary tendencies, scholars might be suffering from Gilman fatigue--from the feeling that pretty much everything there is to say about her life and works has already been more or less said. This is likely a problem within any subfield built exclusively around a single author. From the weary perspective of those in the know, each new study may seem like a piling on, capable at best of refining and reframing established positions rather than breaking new ground. While a new essay or two may be justified, a whole new collection of essays may seem like over-kill. All this is to acknowledge that reviews are rarely neutral, and that certain reviewers may be predisposed to greet new contributions to an over-saturated field with skepticism. Sometimes, however, a book pushes back against a reviewer's preconceived notions, ultimately overcoming them on the strength of its merits. Happily, Bergman's book falls in the latter category. By organizing the collection around place rather than simply Gilman herself, Bergman broadens its general relevance and appeal. Since critical studies of Gilman typically accentuate gender as a category of analysis, they may inadvertently play down the importance of categories like place. This new collection's sustained emphasis on place is its strongest claim to both originality and an audience larger than Gilman scholars. Other topics discussed include Gilman's views on gender, sexuality, ethnicity, race, and class (a category that, perhaps, could have been emphasized more consistently throughout) as well as on her own legacy. Most of the essays derive from papers presented at the Second International Charlotte Perkins Gilman Conference (2011). By my count, this is the fifth such volume generated from one of these conferences. 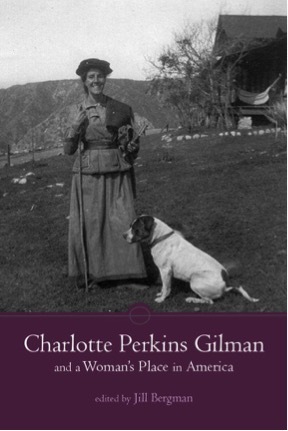 The earlier collections, featuring a number of the same contributors who also appear in the present volume, are Charlotte Perkins Gilman: Optimist Reformer, edited by Jill Rudd and Val Gough (1999); The Mixed Legacy of Charlotte Perkins Gilman, edited by Catherine J. Golden and Joanne Schneider Zangrando (2000); Charlotte Perkins Gilman and Her Contemporaries, edited by me and Denise D. Knight (2004); and Charlotte Perkins Gilman: New Texts, New Contexts, edited by Jennifer S. Tuttle and Carol Farley Kessler (2011). This new volume comprises uniformly strong contributions from both well-known Gilman scholars and new voices; indeed, nearly all of the major Gilman scholars are represented--two of them (Tuttle and Gary Scharnhorst) more than once. Bergman's brief introduction foregrounds the volume's attention to space and place, two terms she posits as largely interchangeable. Bachelard's The Poetics of Space serves Bergman well as a starting point for her efforts to situate Gilman within the critical conversation concerning place, especially since the French philosopher's inattention to gender provides an entrée for the volume's central concerns: Gilman's career-long preoccupation with the gendered dimensions of varied spaces and places along with her critique of woman's alleged "sphere." During her lifetime, Gilman set out to disprove the bourgeois contention that a woman's place not only was, but should be, the home. For her, the home functioned not as a haven from the heartless world but rather as a barrier to what she called "world service" for women like herself. Rather than joining the "cult of domesticity," she harshly criticized the conventional middle-class home as a place of debilitating constraint; as I've argued elsewhere (Arizona Quarterly, 2010), rather than sentimentalizing the home and woman's place therein, Gilman frequently romanticized the world beyond the home. Elaborating on these points, Bergman's volume is divided into three sections: 1) "Geography and Biography: Places in and of Gilman's Life"; 2) "Know Your Place: Limits on Women's Freedom and Power"; and 3) "Reclaiming and Redefining a 'Woman's Place.'" The sites explored across the nine essays include imaginary and actual settings, homes, buildings, regions, cities, and countries as well as both interior landscapes and two-dimensional surfaces such as the canvas and the page. Yet despite the volume's focus on "woman's place in America," it only sporadically explores Gilman's numerous nonfictional writings on place and space. Instead it focuses on Gilman's fiction, both familiar stories like "The Yellow Wall-Paper" or her Gothic story "The Giant Wisteria" and lesser-known works like her short story "Turned." More than 30 illustrations, some hitherto unpublished, help readers visualize both the contributors' concerns and those of their shared subject. The first essay, portions of which first appeared in Tuttle's "New England Innocent in the Land of Sunshine: Charlotte Perkins Gilman and California (Western American Literature 48.3, Fall 2013), launches the collection strongly. Co-authors Tuttle and Scharnhorst explain the role of the West in Gilman's life and offer an innovative reading of Herland within the Western tradition. In particular, the co-authors show how the 1915 Panama-Pacific International Exposition helps clarify Gilman's interventions in western literary studies and critical western regionalism, both known for their masculinist biases. They thus paint Gilman as something of a genre trailblazer even as they refuse to play down her eugenicism, xenophobia, and imperialism. Equally original in its own way is Denise D. Knight's meticulous essay on portraits and photographs of Gilman, including the one on the dust jacket above. Nearly every page of Knight's essay includes a photograph or depiction of Gilman that is either newly-discovered or little-known, helping us, as Knight acknowledges, to "'see' and 'read' Gilman through the eyes of others" (48) while illuminating the physical and emotional spaces she occupied. Also worth notice are the essays by Sari Edelstein and Peter Betjeman as well as a second essay by Scharnhorst, though the latter two are reprints. Mining Gilman's neglected Forerunner fiction, Edelstein extends claims about Gilman's critique of mainstream journalism that she previously advanced in "Charlotte Perkins Gilman and the Yellow Newspaper," Legacy 24:1, 2007) and Between the Novel and The News: The Emergence of American Women's Writing (2014). In an essay first published in 1993, Scharnhorst analyzes Gilman's frontier Gothic, and in a study first published in American Literary Realism (46:2, Winter 2014), Peter Betjemann insightfully probes the relationship between Gilman's narrative strategies and the built environment. Although "The Yellow Wall-Paper" is mentioned here and there, the volume's only original extended analysis of this oft-analyzed tale is William C. Snyder's intriguing interpretation of it as an exercise in ekphrasis. Treating the wallpaper as a canvas and the nursery as a gallery, Snyder casts the protagonist as a "modern antiheroine" because of her non-traditional, "unusual sensibilities and perceptions" (76, 73). Though he stretches credulity in claiming that the story represents the "first modernist work of fiction by a woman" (75), he treads safer ground in emphasizing its striking affinities with modernism. In particular, with the aid of art history, myriad images, and close readings, he clarifies the importance of perspectival perception in "The Yellow Wall-Paper," noting that a good forty percent of the story describes the narrator's reactions to visual stimuli. Other persuasive essays include Brady Harrison's analysis of Gilman's novel The Crux as an expression of compatibilism and Catherine J. Golden's reading of Gilman's short story "Turned." Golden's essay is knowledgeably informed by postal history, material culture studies, theories of triangulated desire, and the wider context of Victorian literature--especially the epistolary tradition. In a concluding essay that surveys and justifies continued efforts to recover Gilman, Tuttle carefully links these projects and the recovered works themselves to the larger historical contexts that shaped them. With its nine compelling chapters and its innovative emphasis on place, this volume offers original contributions to the overlapping fields of Gilman studies, place studies, and gender studies. As such, it should serve as an excellent resource for scholars in all those fields--even for those who might initially be inclined to wonder whether we need yet another essay collection on an already much-discussed author. Cynthia J. Davis is Professor of English and Associate Dean for Arts, Humanities and Social Sciences in the College of Arts and Sciences at the University of South Carolina in Columbia. Leave a comment on Cynthia J. Davis's review.